In order to write a first draft you need unbridled creativity not criticism, even warranted criticism. In this article I look at various ways to turn off your inner editor, or at least tune her out. Ideally, I would have posted about this just before NaNoWriMo, but better late than never! One of the worst things for a first draft--or at least this has been my experience--is being critical of your writing. Notice I didn't say OVERLY critical because on a first draft being critical is being overly critical. Yes you could have chosen a different word and, no, perhaps that's not the right word. You sense there's something off about it, that another would serve better, but you can't think what it is. Oh well, grab a cup of coffee, you need to fix that before you go on. No point in continuing if you'll just have to come back and redo it later. Right? Your first draft will be crap. You're going to want to put it in your Last Will and Testament that any first draft you're working when you pass beyond this veil of tears will be burnt, unread. Only if I totally and completely embrase that attitude can I roll up my sleeves and start to write. For the past few days I've been editing the first draft I wrote during NaNoWriMo 2012 and you know what? Some of it was crap, but a lot of it wasn't. Most importantly, as I combed through my manuscript I was able to quickly and easily create an outline that will be very close to what the book looks like when it's done. Or at least that's what it feels like at this stage. My point is that a first draft gives you something to work from, something to revise. It gives you a feel for the scope of your story and where the (gaping) holes are. It lets you think about your plot in greater detail. If you don't like a word, or even an entire scene--or chapter--take it out! Redo it. But you need something to work from. It's hard to get somewhere unless you know where you're headed, and that's what your first draft gives you: a road-map. Hopefully by now you all agree that turning off your inner editor--or at least tuning her out--while you're writing your first draft is a good idea. The question is: How? Kim Neville has written a fabulous article on this subject: Tuning Out Your Inner Editor. She gives 4 tips on how to do this, but because I want you all to read her article (it's great and she is a terrific writer), I'm just going to give 2 here. Sometimes the only way through to the end is to fool myself. My first drafts are always called “Draft Zero”. They’re less than first drafts. They don’t even count. Somehow it’s easier to write a story when I’ve convinced myself it’s not real. I also use Scrivener so I can only see the scene I’m currently working on and am less tempted to tinker with previous ones. Kind of like the writing equivalent of keeping your chocolate stash hidden in a cupboard. Great idea! I'm going to do this from now on. It’s easier to ignore that critical voice in your head when you’re in a time crunch. I attended Clarion West this summer. Secretly I wondered if I’d be able to complete a story every week. It turns out I could. The deadline mobilized me. NaNoWriMo can be a powerful tool for letting loose. Critique groups are great for productivity too. Knowing the group is expecting a story helps force the words out. I can vouch for NaNoWriMo. I wrote over 50,000 words in 26 days and am happy with my first draft, especially since I've been (so far at least) able to preserve some of the momentum I had during November. For me, that's probably the most valuable thing. Kim gives two more great tips! You can read them here. Before I go I want to mention that Kim Neville is a recent graduate of Clarion West and that she has a great blog about her life, her work, and the many challenges facing writers today: Kim Neville: Faith, trust, pixie dust. 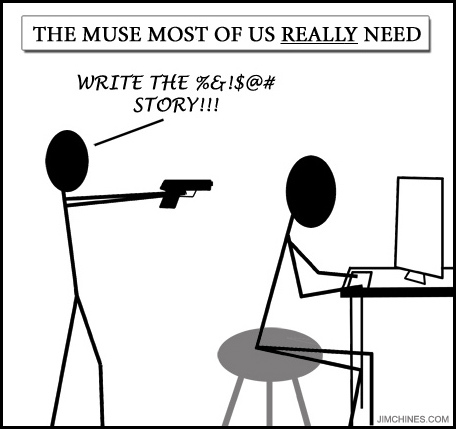 That's a muse you don't want to turn off! Photo credit:"One of Those Days" by *clairity* under Creative Commons Attribution 2.0.